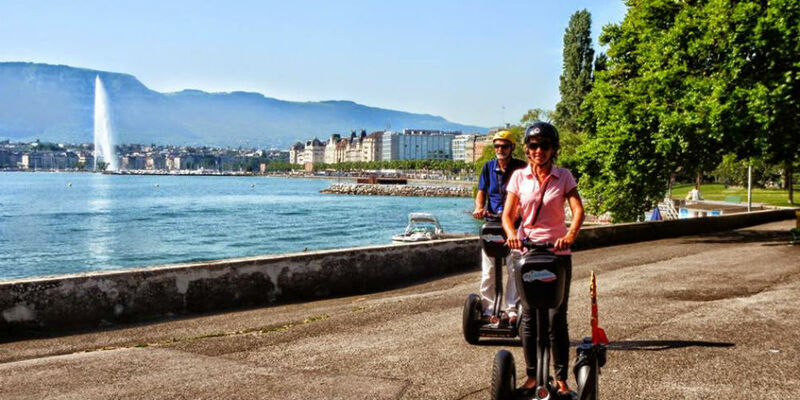 Citywheels “les Cygnes” is the #1 rated Segway tour operator in Geneva (Tripadvisor). Our Segway tours are for ages 16 and above, and you must have a valid driver’s licence (scooter / car). Geneva Old Town tour –You will travel to the time of Calvin and of the Reform on this guided tour in the Old Town of Geneva. Segways are the best way to see its narrow and steep streets. The cobblestones won’t be a problem for you and the Segway, too. The tour lasts 75-90 minutes, including the initiation on the Segway at our centre, and costs are 99 CHF per person. Tours can be organized every day departing from our terrace (Administration floor) at Les Cygnes Shopping Centre, next to the Railway Station. Departure times and schedules are daily 10 a.m., and 2 p.m.
Come and discover the International Geneva , from the League of the Nations up to the actual United Nations, and all its international organisations. You will ride on the beautiful waterfront where famous people, like the Empress Sissi and the American President Woodrow Wilson , used to come. You will then go the nicest parks of Geneva along the Lake and then get to the peaceful International Organisations Quarter . All this will be made on a Segway ! The tour lasts 2 hours, including the initiation on the Segway at our centre, and costs 129 CHF per person. Tours can be organized everyday at 10AM and 2PM departing from our terrace (Administration floor) at Les Cygnes Shopping Centre, next to the Railway Station. You are staying in Geneva only for a few days or only one ? And you want to see as much as possible of Geneva ? So the Geneva All-in-One is made for you. In only one day you will see all what there is to see in Geneva : the Old Town, the Cathedral, the Lake of Geneva, the United Nations and more ! This tour will lead you both to the historical part of the City of Geneva and the newer part of it, which includes the United Nations, the other International Organisations and the Parks along the Lake. he tour lasts approximatively 3 to 3.5 hours, including the initiation at our center. The cost is 199.- CHF per person. Tours can be organised every day departing from our terrace (Administration floor) at Les Cygnes Shopping Centre, next to the Railway Station. Departure times is daily 10AM and 2PM, but you should reserve in advance.